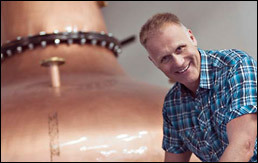 Vapor Distillery of Boulder, Colorado, USA is at the forefront of the American Craft Spirits movement. Fresh from their success at the World Gin Awards, where they won World's Best Cask Aged Gin, Vapor Distillery is looking to expand its distribution network. “Our current range of five spirits has over 30 awards from domestic and international competitions,” remarks Alastair Brogan, co-owner, distiller, and Glaswegian. “We are currently in seven US States as well as Hong Kong, Italy and Denmark. I am always looking for distribution partners who support the craft folks. I would love to see our spirits in more of Europe, especially the U.K., where there is a place for artisan drinks. Alastair, who hails from Glasgow, Scotland, moved to Boulder four years ago with his American wife and two young sons. He spent 10 years in the RAF, then 15 years growing a family business, which finally was sold to it largest competitor. It was then that Alastair started to think seriously about making whiskey. “I was brought up in a country where there was a distillery around every corner and I have memories of my dad taking me on distillery tours. I was always fascinated. It has always seemed like an ancient art, and I appreciate the creativity of the process,” explains Alastair. “Whiskey has always been in the family. I grew up with stories of my grandfather Bernard working in a steel works in Upstate New York making Scottish whisky for his Irish co-workers and the Irish workers making Irish whisky for their Scottish co-workers. Bernard eventually returned to Scotland, and still made small batches, which I helped to bury in the back garden to hide from my grandmother. Alastair hit the ground running and ordered a traditional copper pot still from famed Forsyths of Rothes in Scotland, at the time without a place to actually put it. He then started his research which lasted over a year. “I literally visited every distillery in Colorado, tasted everything, talked to everyone. I then decided to go back to my roots, quite literally, and spent my Whisky apprenticeship at Arran Distillery, a traditional single malt whiskey company on the Isle of Arran, off the west coast of Scotland. That was two years ago… Now, Vapor Distillery has just invested US$1.5m into its production capacity, allowing it to run full brewing equipment alongside its still. It currently produces a Western Style gin, a barrel aged gin, a coffee liqueur, a pumpkin liqueur and a vodka. After much research and experimentation in their tasting room, 2016 will see the launch of a Genever gin, a Navy Strength Gin, a Dry Gin and one or two gin based fruit liqueurs.